Thank you campers of our intense two-day Creativity Camp workshop where "Kids Dig Earth". We had an awesome, FUN time together! Thanks especially to all our teen coaches, guests, donors and adult volunteers. We simply couldn't have done it without YOU!!! Each day, our guests, activities and art experiences helped us delve deeper into earth's soil, sea, space and sky. In addition, campers participated in a GIVE & TAKE by designing more than 150 flower pens as "pick-me-ups" to brighten the day of patients at University of Maryland/St. Joseph Medical Center's Cancer Center-- our camp creative giving project. Wow! 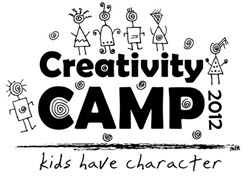 Special thanks to everyone who attended our first Creativity Camp where "Kids have Character"! We had an exciting and truly meaningful week together. And, thanks to our coaches, sponsors, donors and guests. You are amazing! Each day was jam-packed with guests (a.k.a. expert "characters"), plus activities and art expereinces in writing, art, music, gardening and drama for our campers (ages 5-9). In addition, campers prepared more than 150 activity bags for kids in need at Franklin Square Hospital's Pediatric ER -- our camp creative giving project. Wow!